What Do You Need In A Horse First Aid Kit? Horses can be rather accident prone, and horse-involved human injuries are common among equestrians. That’s why it is very smart to keep a complete first aid kit in your barn and have another, smaller kit to take along when you ride. In this article, we present horse first aid kit checklists for both, along with some interesting informational videos to help you compile equine first aid kits for your barn and your saddlebag. Read on to learn more. Keep your first aid kit ready to use and in good order at all times. Whenever you use an item, be sure to purchase a replacement and put it in the box right away. Should I Buy A Ready Made Kit Or Make My Own? 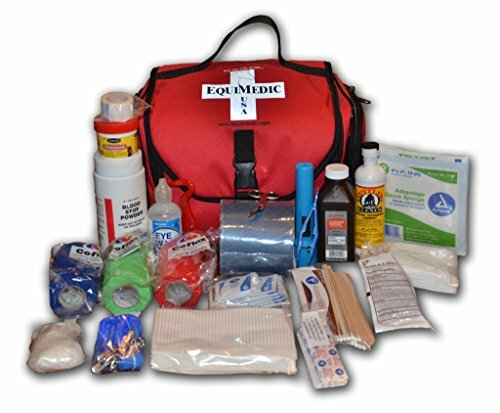 There are certainly plenty of choices in pre-made equine first aid kits to be had, but these tend to be fairly generic and fairly pricey. When you make your own first aid kits, you can save money and include the items you know you will really need. That’s why, at the end of the day, it just makes more sense to assemble your own kits. Draw from the information presented here to create a comprehensive, personalized horse first aid kit checklist that will help you in those time pressure situations, in which you need to react quickly to various horse health related matters.